The bulletproof executive provided the inspiration for this recipe. While I don’t regularly drink coffee, I love his bulletproof coffee recipe, usually substituting my favorite tea. On the mornings I don’t feel like a smoothie, which is often the case in the winter, I heat up some tea and make an elixir. Think of an elixir as a mocha or latte, creamy and rich, with enough calories to keep you going until lunch. I don’t have anything against coffee and have read several studies expounding its health benefits, it’s just not my thing. I prefer herb/medicinal teas or if I need a pick-me-up, something milder such as green tea, Yerba Mate, or Guayusa. Once you have your liquid of choice you just need a good fat source or two to round out your elixirs. Coconut oil is ideal, and if you’ve spent anytime on my site you know how much I love this superfood. Coconut oil alone will suffice, but I like to add an additional fat such as butter or ghee. You might be thinking, “Whoa Ryan, that’s a lot of fat!”. I’m here to tell you healthy fat is where it’s at! Fat has been vilified for way too long. Just look around, if low-fat diets are the key to losing weight then why is everyone over weight. Truth is, healthy fats are some of, if not the most important and healthful foods you can consume. Healthy fats such as coconut oil, palm oil, extra virgin olive oil, expeller expressed sesame and flax oil, avocado, and butter and animal fats from grass-fed, pastured, humanely raised animals. For the backstory on bulletproof coffee and more fat extolling, see How to Make Your Coffee Bulletproof…And Your Morning Too. 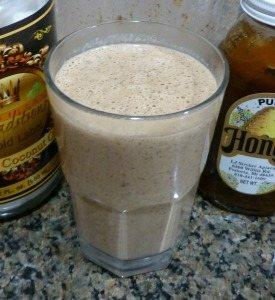 If you’re new to elixirs and want more info on these frothy delicacies, see my first elixir recipe, chocolate coconut elixir. This recipe calls for 1 tablespoon of coconut oil and butter. You can work your way up to 2 tablespoons of each. Enjoy! Place all the ingredients into your high-speed blender followed by the coffee or tea and blend for around 30-45 seconds or until nice and frothy. I’d love to know if you’ve ever had bulletproof coffee or try this bulletproof elixir – please leave a comment below. Happy Blending! I have just joined the whole ‘Bulletproof’ coffee way of life. It tasted great, not only that, it was filling too. I had more energy than if I’d eaten toast with a sugary spread. I am still new so, I am sure with time my body will adapt and I will be fitter, faster, leaner and stronger. Your bulletproof coffee/elixir look delicious. I haven’t tried the MCT oil yet, anxious too. These drinks leave me feeling great and full of energy too. Here’s to a fitter, faster, leaner, and stronger you! I love bulletproof coffee. It provides great energy and makes me feel alert. I make 2 servings, one for me and one for my Mother. This recipe keeps us full and satisfied until lunch. Optional: sweeten with 4-8 small, pitted dates or 5 drops of Stevia Glycerite. We like this with or without the sweetener. Please let me know if there’s anything I should change or add. Thanks for the quick reply. In lieu of cacao, I will use Hershey’s Special Dark Coco powder as it’s what I have on hand. Is that okay or should I forego it and look for the cacao? I’d hold off and get some cacao, Karen. Hershey’s is likely sugary and contains other not so great ingredients. Thank you. I’ll swap them out. A couple other ingredient that I will sometimes put in this recipe, especially if I’m using it for a meal replacement, I’ll add a tsp or 2 coffee granules, a cup or 2 of ice to cool it down, a frozen banana, 1/4 cup rolled oats and 2 cups loosely packed spinach. This makes 2 large servings. It’s very filling. If it’s to much, split it up into 4 drinks and store 2 in the fridge for later.